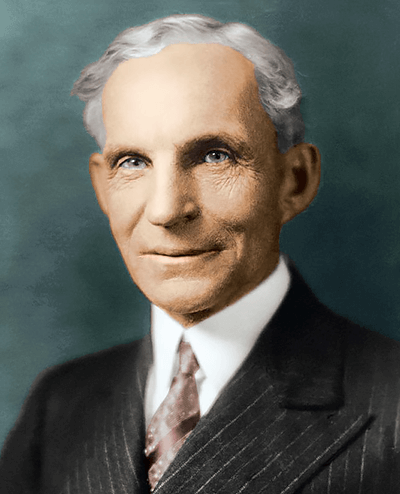 Henry Ford revolutionized the way Americans travel and shaped the course of the 20th century. Like his friend and mentor, Thomas Edison, Ford was an innovator, transforming the automobile from a luxury item to a practical means of transportation. Henry Ford’s pioneering advancements in the automotive industry gave the average American the opportunity to travel freely. The explosive growth that followed led to the modern roadways and transportation systems that we know today. A recipient of 161 patents, Ford not only revolutionized industrial manufacturing and production, but continued to improve upon his initial designs and explore new fields of automotive technology. Like Thomas Edison, Ford was a firm believer in finding natural solutions to industrial problems. Ford pioneered research in producing soybean plastics and finding new sources of natural rubber, and his quest for an American source of natural rubber led him to create two experimental rubber test sites in Florida, one of which—the Edison Botanic Research Corporation—was a collaborative effort with Thomas Edison and tire magnate Harvey Firestone. The groundbreaking work of the trio would lead to important botanical and chemical advancements, as well as aid passage of the Plant Patent Act of 1930 through Congress. Today, the Edison Botanic Research Corporation Laboratory, located in Fort Myers, has been designated a National Historic Chemical Landmark, the first such location in Florida. Ford also conducted aeronautical research in Florida. Ford pilots flew several early Ford-manufactured aircraft in the state. Several Ford commercial aircraft were named after prominent Florida cities, including Miss Fort Myers. In addition, early experimental work on the highly secretive V-8 engine was also conducted in Florida, according to employees engaged in the project. Florida remembers Henry Ford’s contributions to science via the Edison Botanic Research Corporation Laboratory and the Mangoes, winter home of Henry Ford, both located in Fort Myers. Ford’s legacy of innovation and keen interest in research and education continue to inspire new generations.